Tato Architects were faced with a challenge when designing a home for their client in Rokko, Japan — with a lot located high atop a hill, the architects needed to both preserve the dramatic views, but also provide some privacy for the home's residents. And so Tato Architects separated daily activities between those which could be public and those which are private. 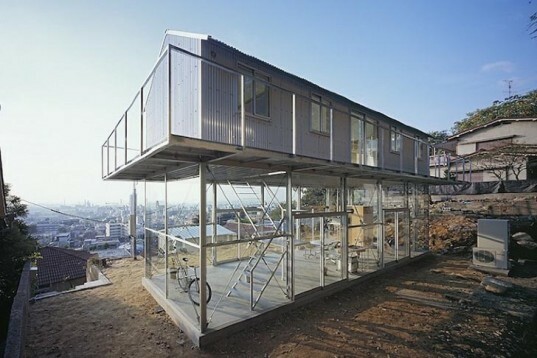 Activities in the first category are housed in the bright, open, glass-walled downstairs of the home, while privacy is afforded by a corrugated steel-clad upper floor. The unusual design makes the most of natural light and resources, while providing amazing views and some space for private matters and relaxation. Tato Architects’ House in Rokko consists of a home and atelier overlooking a beautiful Japanese cityscape. Yo Shimada, a graduate from Kyoto City University of Arts in Environmental Design led the project. Because the site was broad but too steep to bring in heavy machines for driving piles, the home’s foundation was dug manually. The architects separated daily activities into public and private, activities such as meeting guests, playing music alongside facilities such as bike storage are accommodated on the downstairs glazed floor. While more private spaces are created for the kitchen, bathroom and bedroom upstairs, covered by a corrugated steel shell which blends in with the surrounding houses. Featuring naturally ventilated spaces, a thermal storage system for heating and plenty of natural light, topped off by amazing views allows the House in Rokko to achieve the right balance. Tato Architects' House in Rokko consists of a home and atelier overlooking a beautiful Japanese cityscape. Yo Shimada, a graduate from Kyoto City University of Arts in Environmental Design led the project. Because the site was broad but too steep to bring in heavy machines for driving piles, the home's foundation was dug manually. The architects separated daily activities into public and private, activities such as meeting guests, playing music alongside facilities such as bike storage are accommodated on the downstairs glazed floor. While more private spaces are created for the kitchen, bathroom and bedroom upstairs, covered by a corrugated steel shell which blends in with the surrounding houses. Featuring naturally ventilated spaces, a thermal storage system for heating and plenty of natural light, topped off by amazing views allows the House in Rokko to achieve the right balance.